USA Network announced today that the critically acclaimed drama SUITS is set to return for its sixth season on Wednesday, July 13 at 9/8c. The Universal Cable Productions series will be the lead-in to the previously announced second season of the Golden Globe award-winning series MR. ROBOT on Wednesdays at 10/9c. For the past five seasons, SUITS has centered on the fast-paced Manhattan corporate law firm, Pearson Specter Litt, led by legendary lawyer Harvey Specter (Gabriel Macht) and his not-so-legitimate associate Mike Ross (Patrick J. Adams), but after last season’s dramatic turn of events, everything has changed. Season 6 begins immediately following the events of the shocking Season 5 cliffhanger that left Mike behind bars. After signing a plea deal to spare his colleagues at Pearson Specter Litt, Mike will be confronted with the harsh realities of prison life as he starts his two-year sentence. Meanwhile, the once bustling Pearson Specter Litt offices are a ghost town – the partners have defected, leaving Harvey, Jessica (Gina Torres), Louis (Rick Hoffman), Donna (Sarah Rafferty) and Rachel (Meghan Markle) to pick up the pieces. But the firm’s troubles are far from over and they will have to deal with the fallout from Mike's crime before they can even begin to rebuild. This season, SUITS will welcome previously announced new recurring stars including Erik Palladino (“ER,” “666 Park Avenue”), Paul Schulze (“Nurse Jackie”) and Malcolm Jamal Warner (“American Crime: The People vs. OJ Simpson,” “House of Lies”). Over the past year, SUITS has ranked as USA Network’s #1 returning original series and the #2 cable entertainment program on Wednesday nights across all key demos. Season 5 averaged 3.7MM total viewers P2+, 1.7MM P25-54 and 1.5MM P18-49 on a L7 basis, and had its best season ever in video streams, up +39% over the previous season. 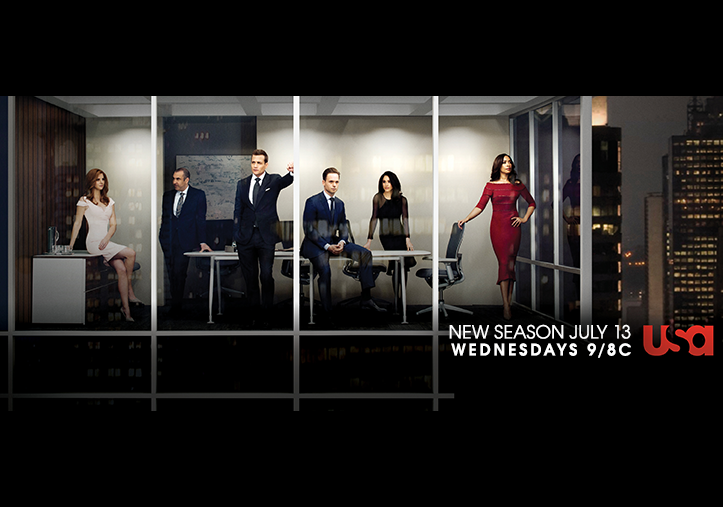 The fifth season of SUITS is available on Video on Demand and fans can catch up on previous seasons via Amazon Prime.